Embird 2017 Build 10.24 FancyWorks. Embroidery Software. Designs. Machine embroidery. Embird. Tajima. PE-Design. Compucon. Bernina. Wilcom. 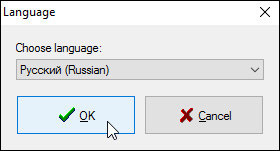 Russifiers programs. Cross-stitch. Free embroidery. Magazines embroidery. Magazines needlework. Books on needlework. Books on embroidery. A popular program for designing Machine Embroidery Designs. Can transform images into embroidery by contour, cover, cross, and also in the original Sfumato technique. All options! All plugins! 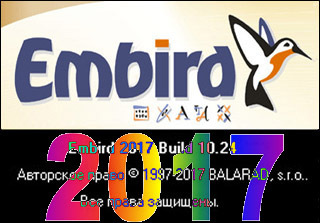 Embird 2017 Build 10.24 - the latest version of the company http://www.embird.com. The program is designed to work in Windows XP, 7, 8, 10. - New option> "Add aligning automatically stitches", which allows you to automatically add alignment of the seams after crushing the object. - New command "Paste"> "align the seams at the selected point", adding allows you to click on any point on the workspace to prescribe aligning points for selected objects. - New command "Insert"> "Small cross", which allows to insert a small cross on the working area, which can be used for alignment, etc. - A new command "to open closed contours of an embroidery by a dagger" has added. It will begin Cross-stitch embroidery plug-in with contours on the work area - can be filled And then compile to return to the editor. - The new "projection" option is now available on the "layout" tab in the "Insert"> "Insert Text", "Insert"> "Insert Text Engine Font", "Insert"> "Insert finished text alphabet" and "Edit"> " Set ">" Install In Envelope "dialog boxes. This allows the design to design either sphere or vertical and horizontal cylinders. Use it to create a 3D effect fill. - Fixed bug in the "Filling Closed Loop Command". - Fixed SIRUBA PLT format. - Fix "Insert / Delete codes" dialog in the editor. - PES Version 10.0 is now supported in Embird. - Fixed errors in PES format, versions 8.0 and 9.0. - Fixed dialog with the final box for the Pfaff 2140 card. - Fixed in the VIP format - displaying colors. .- Finished Alphabets can now be mapped to Unicode characters. - Fixed a bug in the sewing simulator - was a slow pattern stitch. Computers and Windows 10 tablets without a mouse and keyboard. Designs in onedrive Microsoft Cloud Storage. - New setting "settings> settings> automatically save files to another folder" allows you to select the folder in which a copy of each newly created / edited file will be saved. If the onedrive folder is selected for this operation, the identified file is also automatically saved in the onedrive folder on the hard drive. The windows automatically move it to the cloud, which will allow it to be used on other (mobile) devices that connect to the same onedrive Cloud Storage service Microsoft. Copy / move the selected files to this folder or to the onedrive cloud storage from Microsoft Storage. For more information click on the below Banner.